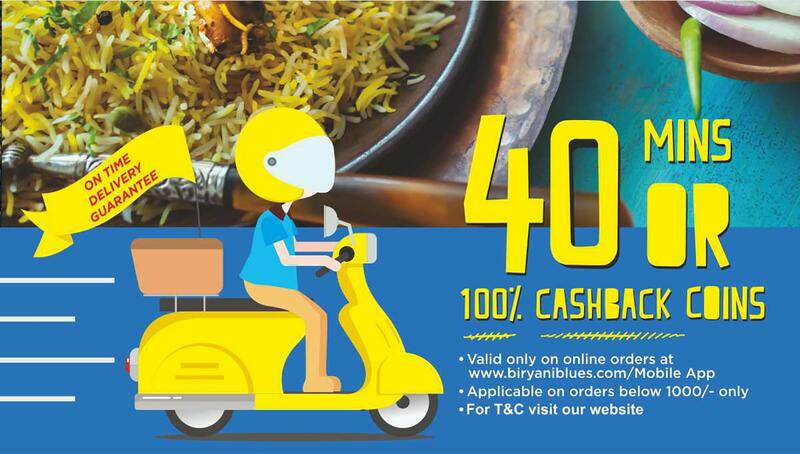 Valid only on online paid orders placed via Biryani Blues website or mobile app. Orders over Rs. 1000/- qualify as bulk orders, and not valid for service guarantee of less than 40 minutes or free*. Maximum Biryani Blues' liability is Rs. 400 per customer. Delivery guarantee time considered till the first barrier point. Not applicable when store operating conditions or not suitable (heavy rains or Road Blockages), to be announced at the time of order taking. Not applicable on Major festivals like New Years Eve, Diwali, Eid, Christmas and Durga Pooja etc. The service guarantee may be withdrawn temporarily in view of difficult operating conditions for delivery. Biryani Blues preserves the right to withdraw the service guarantee without prior information.